Will FTSE4Good's Nestle gamble work? 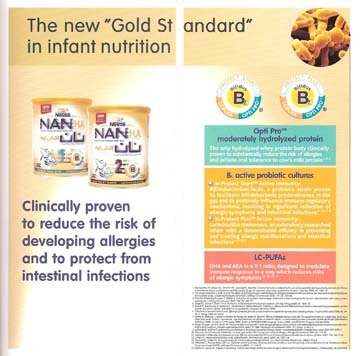 In a move that is causing confusion amongst investors and health campaigners FTSE4Good, an ethical investment listing, has weakened its criteria for the marketing of breastmilk substitutes to allow companies onto the list even while they are violating international minimum standards. Nestlé, added to the list today as a consequence, was excluded until now as it did not comply with the provisions of the previous criteria. Nestlé is the target of an international boycott promoted by Baby Milk Action as it is judged to be the worst of the baby food companies in monitoring conducted around the world. Update 11 July 2011: Click here for Baby Milk Action's briefing recommending that people who want to hold baby food companies to account DO NOT invest in a FTSE4Good tracker. Baby Milk Action is currently campaigning to stop Nestlé's latest global baby milk marketing strategy. The company has added labels to products in 120 countries claiming its baby milk 'protects' babies, even though babies fed on baby milk are more likely to become sick than breastfed babies and, in conditions of poverty, more likely to die. 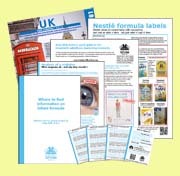 (Left: A leaflet promoting Nestlé formula to health workers with the claim it reduces the incidence of diarrhoea). The Breaking the Rules, Stretching the Rules reports produced by Baby Milk Action's partners at the International Code Documentation Centre show Nestlé to be systematically violating the International Code of Marketing of Breastmilk Substitutes and subsequent, relevant Resolutions of the World Health Assembly. "Whether the FTSE4Good approach of rewarding Nestlé with a listing before it has made changes on the ground will prompt changes remains to be seen. If it does persuade Nestlé to drop its 'protect' logos and other prohibited marketing strategies, then that will be beneficial. On past experience, we expect Nestlé to use its listing by FTSE4Good to try to undermine support for the boycott and in opposing moves for independently monitored and enforced legislation. Our assessment of the policy documents and reports Nestlé produces is they are for public relations purposes to divert attention from the systematic violations that continue on the ground and Nestlé deserves no credit for its dishonesty." "Nestlé puts profits before all else and the boycott makes executives take notice because when we expose poor behaviour this fuels the boycott." According to analysts GMI, Nestlé is one of the four most boycotted companies on the planet and even Nestlé's Global Public Affairs Manager has admitted that Nestlé is 'widely boycotted'. FTSE4Good adopted revised Breastmilk Substitute Criteria in September 2010 as it usually sets criteria in such a way that at least some of the companies in the sector make it onto the listing. The new criteria initially look to company policy statements and descriptions of management systems rather than practices on the ground. Update 11 July 2011: The assessment process adopted by FTSE to investigate practices on the ground is seriously flawed. Click here for further details in Baby Milk Action's briefing recommending that people who want to hold baby food companies to account DO NOT invest in a FTSE4Good tracker. For further information contact Mike Brady on 07986 736179. 1. Baby Milk Action has put a four-point plan to Nestlé aimed at saving infant lives and ultimately ending the boycott. Nestlé has repeatedly rejected the plan. The previous FTSE4Good criteria had some similarities with this. 2. The latest global monitoring report, Breaking the Rules, Stretching the Rules 2010, shows Danone has become a significant source of violations alongside Nestlé as the industry has consolidated. According to Euromonitor, Nestlé controls 29% of the baby food market following its takeover of Gerber. Danone controls 15% following its takeover of NUMICO brands (Nutricia, Milupa, Aptamil and Cow & Gate). 3. Baby Milk Action contacted Danone after its takeover of the NUMICO brands calling it to bring the marketing practices into line with the International Code and Resolutions. Danone promised a 'root-and-branch' review and it was given credit for this. However, monitoring has demonstrated that things have become worse under Danone. For example, it has added 'Immunofortis' logos to brands around the world, in violation of the marketing requirements. Danone has been given until the World Health Assembly in May 2011 to signal it is serious about changing practices or a consumer campaign will be called.